Thermal security cameras are an ideal choice when monitoring large-scale or unique outdoor environments such as heavy forested areas and other areas that have obstructions that make viewing difficult. Thermal surveillance camera technology uses heat that is generated from an object or individual to detect their location. The technology harnessed by thermal security cameras doesn’t need an external light source to operate. For those employing surveillance and security cameras in pitch-black scenes, thermal security camera technology gives the user the ability to see what is going on no matter the level of light, as thermal surveillance cameras rely on heat to detect movement or motion. You can record activity twenty-four hours a day or whenever activity is detected. Since criminal attempts are made in the cover of darkness, thermal security cameras make an excellent complement to your complete IP surveillance system. You can access the cameras with a secure Internet connection even if you are off premises. In many cases, simply having our thermal security cameras in a location will thwart attempts by thieves and vandals, but the added functionality of thermal security cameras is capable of capturing images of trespassers and criminals in 0 lux lighting conditions or busy outdoor areas. In addition to detecting persons in the dark, thermal surveillance cameras are also good for capturing activity when outdoor conditions are less than ideal. 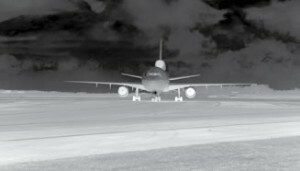 Whether there is a powerful storm occurring, a blanket of heavy fog, or if conditions are compromised by the nature of your work, thermal cameras can still detect persons and objects via heat. Thermal surveillance cameras can be the best option when you have difficult outdoor areas to monitor and want to further enhance the strength of your current IP camera system. The images being delivered by thermal security cameras rely on heat that it is emitted from the individual. Thus, recorded video is strictly for detecting persons or objects in areas where they shouldn’t be. If you already have a low-light security camera in place, the addition of thermal surveillance cameras will significantly improve your security operation. For security applications battling harsh outdoor elements, it can certainly be a wise investment to consider a customizable system that includes thermal surveillance cameras. Not all systems are appropriate for individual security needs. Combining thermal imagery with your current outdoor surveillance system will help ensure that the exterior of your property is protected. Our specialists at we have amassed years of IP experience that encompasses thermal security camera technology. We will closely examine the layout of your property, and recommend security cameras that optimize your surveillance coverage and technology requirements. Home security is pretty important. If you’re not constantly home, there’s always the possibility that someone could be breaking into your home at any given moment. That problem is heightened if you travel a lot for more than a few days at a time. After all, you wouldn’t want to come home after a long trip to find half your stuff gone. Thankfully, technology is here to save the day. There are a ton of great home monitor cameras out there, and every year, they seem to get better and better. You can also use them to watch your pets while you’re at work, keep tabs on your kids when they’re home alone, and monitor your baby in the crib. Last but not least, you’ll want to keep price in mind. Monitor cameras are getting increasingly affordable, but as is the case with almost anything, the more you pay, the better the quality. The gas camera – fugitive emission gas camera is the world’s only gas & voc (volatile organic compound) camera classified for hazardous locations and certified by atex, ul, ansi & csa. These infrared cameras for VOC/gas leak detection are smart LDAR compliant and able to detect more than 30 volatile compounds such as Methane, Propane, Butane, Ethylene and Zylene. Leading Petrochemical, Oil and Gas companies use the gas camera to detect small and large leaks at residential and remote locations including refineries, compressor stations, well heads and where access to perform a traditional leak survey can be problematic. The gas camera has been specifically ruggedised for use in the field. It doesn’t look or feel like others and offers an unmatched design, coupled with superior specifications, reducing operator fatigue and delivering on safety promises. Under a growing threat of terrorist attacks, airport authorities around the world are installing security cameras to keep their passengers, employees, and valuable equipment safe. Westchester County Airport (HPN) near White Plains, NY, recently added security cameras to their array of other cameras and sensors. Security cameras allow HPN’s security operators to see in total darkness. While their other cameras only work during the day, security cameras see clearly 24-hours a day. Because airlines operate around the clock, airports need to be as secure at night as they are during the day. Unfortunately, standard closed-circuit TV (CCTV) cameras need lights to be of any use after dark. They can take advantage of the lights installed to help aircraft taxi to and from the gate areas, but dedicated security lights installations are expensive to engineer and install. Moreover, they can’t be installed everywhere the security professional needs to see, especially along the perimeter. Security cameras don’t suffer from such limitations. They make pictures from heat, so they can see people, vehicles, aircraft and infrastructure clearly in absolute darkness. Thermal security cameras also see farther than comparable CCTV cameras, night and day. This makes them a better solution for securing miles of perimeter fence. We offer a wide range of NIR and UV Cameras suited for many imaging needs. NIR and UV Cameras are ideal for a number of specific imaging applications such as nighttime imaging, or for detecting certain materials through fluorescence in microscopy. NIR and UV Cameras may also be used for quality assurance purposes by detecting flaws or defects observable beyond the visible spectrum. NIR and UV Cameras are available in either CCD or CMOS sensors, as well as monochrome or color imaging options. Quantum dots (QDs) are attractive systems for potential applications in future solar energy technologies, due to their optical properties which are tunable as a function of size and composition. In this study, we synthesized PbS QDs with first excitonic peak in the range 1060 to 1300 nm using a PbCl2/sulfur molar ratio of 10:1. The first excitonic absorption peak from 1300 to 950 nm of the PbS/CdS infrared core/shell QDs can be further synthesized via the cation exchange approach. Our method resulted in high quantum yield, good stability, monodisperse QD solutions with a full surface coverage by excess Cd cations. In addition, we used our infrared core/shell QDs in a photoelectrochemical cell for hydrogen generation. This heterostructure exhibited a saturated photocurrent as high as 3.3 mA cm−2, leading to ~29 ml cm−2 d−1 hydrogen generation, indicating the strong potential of our infrared core/shell QDs for applications in water splitting. Get the infrared cameras that are built on 65+ years of industrial experience. Each camera is built without compromise to the standard of “ruggedness, reliability and accuracy”. Designed for everyday use, in any environment for thorough and accurate inspections. Choose from the affordable and versatile Performance Series, the Professional Series that offers superior image quality, or the Expert Series that gives you up to 1024 x 768 resolution on the industry’s largest screen.